Summer constellations are the constellations that are best seen in the evening night sky from late June to late September in the northern hemisphere and from late December to late March in the southern hemisphere. In addition to the circumpolar constellations – Cassiopeia, Cepheus, Draco, Ursa Major and Ursa Minor in the northern hemisphere and Carina, Centaurus and Crux in the southern – there are several prominent constellations that dominate the summer sky. For northern observers, these are the three constellations whose brightest stars (Altair, Deneb and Vega) form the Summer Triangle – Aquila, Cygnus and Lyra – along with the southern zodiac constellations Sagittarius and Scorpius, and the large constellations Hercules in the northern and Ophiuchus in the southern sky. Draco is found overhead in the northern hemisphere in the evening. It is a large circumpolar constellation that contains the north pole of the ecliptic. Draco has only three stars brighter than magnitude 3, the brightest of which is Etamin, Gamma Draconis, a magnitude 2.2 orange giant. Draco is home to several notable deep sky objects, including the Spindle Galaxy (Messier 102), the Cat’s Eye Nebula, and the Tadpole Galaxy, an interacting pair of galaxies also known as Arp 188. Aquila and Cygnus, the celestial Eagle and Swan, are high in the sky in the summer evenings and can be seen facing each other. Aquila, the Eagle, contains Altair, one of the closest visible stars to Earth, lying at a distance of only 17 light years. Altair forms the Summer Triangle, a prominent summer asterism, together with the bright stars Deneb in Cygnus and Vega in Lyra. Cygnus, the Swan, is one of the most recognizable summer constellations. Its brightest stars form an asterism known as the Northern Cross, which is prominent in the evening sky in the summer months. 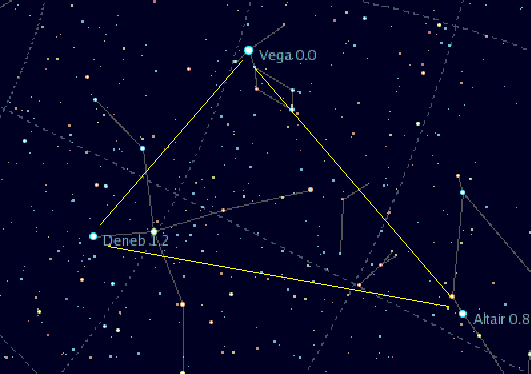 Deneb, the brightest star in the constellation and one of the brightest northern stars, marks the Swan’s tail. It is one of the brightest northern stars and the most distant first magnitude star, lying approximately 3,550 light years from Earth. Cygnus contains a number of other notable stars. Albireo, Beta Cygni, is a binary system popular among amateur astronomers for its contrasting colours. It marks the Swan’s head and is sometimes called the “beak star”. Sadr, Gamma Cygni, sits at the center of the Northern Cross and marks the Swan’s chest. The star is surrounded by a diffuse nebula catalogued as IC 1318, also known as the Sadr region (Gamma Cygni region). Interesting deep sky objects in Cygnus include the X-ray source Cygnus X-1, the bright open clusters Messier 29 and Messier 39, the Fireworks Galaxy, and several notable nebulae: the Pelican Nebula, the Crescent Nebula, and the Veil Nebula. Lyra, a small constellation located between Cygnus, Hercules and Draco, easily recognized for its shape of a parallelogram, is home to Vega, the fifth brightest star in the sky, and two other famous stars. Sheliak, Beta Lyrae, is prototype of the Beta Lyrae variables, a class of binary stars that are so close to each other that material from one star flows to the other and the stars become egg-shaped. Epsilon Lyrae, nicknamed the Double Double, consists of two sets of binary stars orbiting each other. Located near Vega, the system is a popular target for amateur astronomers. The best known deep sky objects in Lyra are the globular cluster Messier 56, the famous Ring Nebula (Messier 57), the trio of merging galaxies catalogued as NGC 6745, and the open cluster NGC 6791. Next to Vega, a group of stars form an asterism known as the Keystone. These stars belong to the constellation Hercules. Hercules, the fifth largest constellation in the sky, does not have any first or second magnitude stars. It is easy to identify because several of its stars form the Keystone, a prominent summer asterism that represents Hercules’ torso. The constellation is usually depicted as Hercules standing on the head of the mythical Ladon, the dragon he defeated as part of his 12 labours. The dragon is represented by the neighbouring Draco constellation. Hercules is home to two Messier objects: the bright, large Hercules Globular Cluster (Messier 13) and the slightly dimmer, denser and smaller Messier 92, one of the oldest known clusters in the Milky Way. The constellation also harbours the Hercules Cluster of galaxies, with about 200 known members, the interacting pair of galaxies Arp 272 (NGC 6050 and IC 1179), and the active galaxy Hercules A. On the other side of the Keystone, between Hercules and Boötes, lies Corona Borealis, a small constellation shaped like a horseshoe or tiara. An imaginary line drawn from Altair toward the center of the Summer Triangle leads to the small constellations Sagitta, the Arrow, and to Vulpecula, the Little Fox. Delphinus, another small constellation with an easily recognizable shape, can also be seen near Altair, outside the Summer Triangle. The zodiac constellations Sagittarius and Scorpius can be seen above the southern horizon in the summer. 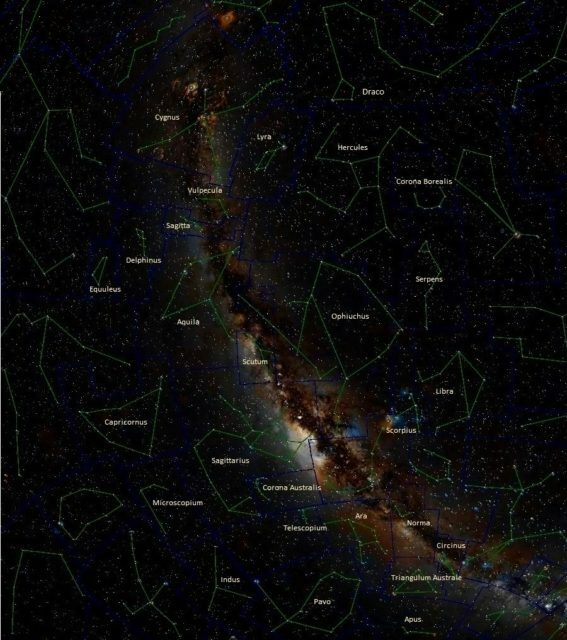 Sagittarius is one of the most prominent constellations in the southern sky. It is easy to recognize because its brightest stars form an asterism known as the Teapot. 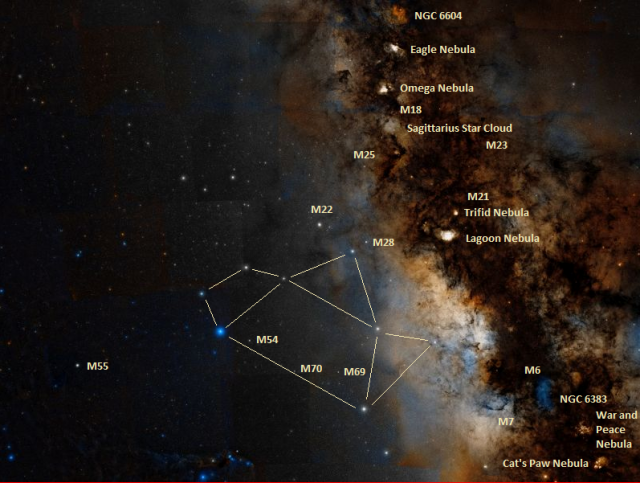 Located on the Milky Way, the constellation harbours a number of notable deep sky objects. These include the radio source Sagittarius A, believed to mark the center of the Milky Way, the Sagittarius Dwarf Elliptical Galaxy, Barnard’s Galaxy, the Quintuplet Cluster, the Pistol Nebula with the luminous Pistol Star, the Arches Cluster, and a total of 15 Messier objects, among them the Lagoon Nebula (M8), the Trifid Nebula (M20), the Omega Nebula (M17), the Sagittarius Star Cloud (M24), and the Sagittarius Cluster (M22). The neighbouring Scorpius is also home to many interesting stars and deep sky objects. The constellation’s brightest stars, Antares and Shaula, are among the brightest stars in the sky. Antares marks the celestial scorpion’s heart, while Shaula is one of the two stars at the tip of its curved tail. There are four Messier objects in the constellation: the globular clusters Messier 4 and Messier 80, and the open clusters Messier 6 (Butterfly Cluster) and Messier 7 (Ptolemy Cluster). The constellation is also home to the Butterfly Nebula (Bug Nebula, NGC 6302), the Cat’s Paw Nebula (NGC 6334), the Northern Jewel Box Cluster (NGC 6231) and the War and Peace Nebula (NGC 6357). Ophiuchus, the Serpent Bearer, is the 11th largest constellation in the sky. Depicted as the mythical healer Asclepius holding a snake – represented by the constellation Serpens – Ophiuchus is home to many interesting stars and deep sky objects. Rasalhague, the constellation’s brightest star, marks the healer’s head. Barnard’s Star, the fourth nearest star to the Sun, after the three stars in the Alpha Centauri system, is only 5.96 light years away, but invisible to the naked eye. Kepler’s Supernova (SN 1604) is a famous remnant of a supernova observed in 1604, which appeared as the brightest star in the sky at its peak. Ophiuchus is also home to the Twin Jet Nebula (Minkowski’s Butterfly) and the large dark nebulae Barnard 68 and the Dark Horse Nebula, which includes the smaller Pipe Nebula and Snake Nebula. The constellation also contains several bright globular clusters catalogued by Charles Messier: Messier 9, Messier 10, Messier 12, Messier 14, Messier 19, Messier 62 and Messier 107. Serpens is divided into two parts by Ophiuchus: Serpens Caput (the head of the serpent) and Serpens Cauda (the serpent’s tail). Despite its relatively large size, Serpens is a pretty faint constellation. Its brightest star, Unukalhai, has a visual magnitude of 2.63 and is the only star in Serpens brighter than magnitude 3. Serpens contains the bright globular cluster Messier 5 and the Eagle Nebula (Messier 16), one of the most famous nebulae in the night sky, known for the star-forming region nicknamed the Pillars of Creation. The constellation also harbours Seyfert’s Sextet of galaxies, a very dense galaxy cluster, Arp 220, the prototypical ultraluminous infrared galaxy (ULIRG) and nearest of its kind to Earth, the Red Square Nebula, a rare astronomical object with a square shape, and Hoag’s Object, the best known ring galaxy in the sky.